The Naugatuck Valley League crowned singles and doubles tennis champions last week. In the boys tournament, Woodland’s Josh Powanda reached the singles final against Wolcott’s Alex Hale last Wednesday at Wolcott High School. Hale prevailed, 6-0, 6-2, to win the title. Powanda defeated Holy Cross’ Dan Huang in the semifinals, 6-4, 4-6, 7-5. It was a match that took 160 minutes to play and a lot out of Woodland’s top singles player. Although the final’s first set was a bagel, Hale had to fight through six deuce games to win it. That didn’t help Powanda’s energy level either, by the way. On the doubles side, Naugatuck’s teams of Chris Cook and Jay Mezzo and Jared Montini and Tommy Martins fell in the semifinals. Torrington’s Brett Stater and Kevin Dixon, the eventual champions, beat Cook and Mezzo, 7-6 (4), 4-6, 6-0. Torrington’s Brendan Cisowski and David Teti defeated Montini and Martins, 6-4, 6-3. 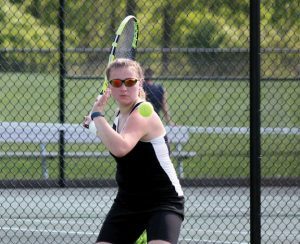 In the girls tournament, Woodland’s Amanda Doughney fell to St. Paul’s Victoria Kilbourne, who went on to win the title, in the semifinals of the singles tournament last Wednesday at Woodland. Kilbourne won the match, 3-6, 6-1, 6-1. Three of the four doubles teams in the semifinals were from Naugatuck or Woodland. Woodland’s Mia Piccolo and Alanna Carasone reached the final match by beating Naugatuck’s Sabrah Cegielski and Catarino Rego, 7-6 (7-5), 6-4, in the semis. Sacred Heart’s Alexa Gallino and Nhi Nguyen defeated the Woodland due in the final, 7-5, 6-1. Gallino and Nguyen beat Naugatuck’s Brielle Behuniak and Hailey Russell, 6-0, 6-2, in the semifinals. State tournaments: State tennis tournaments kicked off this past weekend. In the Class S girls tournament, No. 11 Woodland lost 7-0 to No. 6 Granby in the first round. The state open starts Friday. The boys got right into singles and doubles play. Powanda, the No. 14 seed in the Class S singles tournament, advanced to the third round where he fell to No. 3 Drew Morris of St. Joseph, 6-1, 6-0, on Tuesday. Powanda defeated Stonington’s Quinn Hamilton, 6-0, 6-0, in the first round and Housatonic Regional’s Jack Scarpa, 6-0, 6-1, in the second round. Woodland’s Nick Hudson and Richie Weishner both lost in the first round. In Class S doubles, the Woodland teams of Vinny Zheng and Sebastian Wojcik, Timothy Mendes and Austin Roberts, and Gabriel Sousa and Jeffrey Varesio all dropped first-round matches. The Naugatuck boys played in the Class L tournament. Dylan Triscritti and Zakary Robushi fell in the opening round of singles play. Andres Maldonado and Brandon Sampaio dropped first-round matches. In doubles, Martins and Montini and Cook and Mezzo advanced to the second round. Martins and Montini beat Bristol Central’s David Gao and Michael Kaminski, 6-3, 6-1, in the first round. They fell to No. 9 Jack McCarthy and Alessandro Sulpizi of New Canaan, 6-0, 6-0, in the second round on Tuesday. Cook and Mezzo opened play with a 6-2, 6-4 win over Kyle Cyr and Jason Lipscomb from Bristol Eastern. They lost to No. 14 Jamie Cutler and Griffen Dayton of New Canaan, 6-2, 7-6 (7-5), in the second round on Tuesday.